When talking of apartheid, people spontaneously visualize the period between 1948 and 1999 when the strict rules of racial segregation were in place in South Africa. “Apartheid” is an Afrikaans word, which means the state of being apart. Apartheid laws were abolished following the general elections in 1994 and after a set of intensive and breathtaking negotiations between the ruling National Party and the outcast African National Congress preceded by the historic decision of President F W de Klerk in releasing the iconic ANC leader Nelson Mandela after serving a 27-year-long term in prison. Apartheid was officially and nominally eliminated from the face of the South African society, and it’s around three decades that the white minority and the black majority of the country are living alongside each other in peace, equality and tolerance. Apartheid laws were truly repulsive and unjustifiable. For example, based on the Extension of University Education Act of 1959, black students were prevented from attending the universities which were exclusive to the whites. Or by virtue of the 1953 Reservation of Separate Amenities Act, segregation was enacted in all public places, including the administrative buildings, airports, terminals, etc. Even there are people who recount that in the painful days of apartheid, the black men were not allowed to drink water from the faucets that were made for the white citizens. Now, for the people of South Africa, apartheid is only a past memory that will be never rejuvenated and born again. However, in another part of our world today, there’s a nation that is living under the miserable conditions which make them feel as if an apartheid regime is ruling them. The subjugated nation of Palestine whose homeland was stolen and taken from them around six decades ago in the most repugnant and inhumane way, are now subject to the atrocities of a colonial regime whose behavior, practices and policies are precisely reminiscent of the black and horrific days of apartheid in South Africa. There are incredibly close similarities between the policies and actions of the apartheid regime in South Africa and the Israeli regime that is considered by the United Nations and other international organizations as an “occupying power.” Israel has established a system of racial discrimination against the Palestinians living in the Gaza Strip, West Bank and East Jerusalem Al-Quds that many legal experts and international lawyers have argued constitutes a crime against humanity. From a legal point of view, it’s clearly demonstrable that the Israeli regime is simultaneously violating several internationally-recognized conventions and treaties of which it is a signatory, and most interestingly, when Israel commits acts in violation of these conventions and treaties, no voice is raised in protest by those who had introduced the treaties and are responsible for upholding them. “Adalah: The Legal Center for Arab Minority Rights in Israel” has listed some 50 laws passed by the Israeli parliament (Knesset) that discriminate against the Palestinians in all areas of life, such as their right to political participation, access to land, education, state budget resources, medical services, and criminal procedures based on their race and nationality. According to the Adalah center, this provision mainly affects Arab Bedouin children living in the Naqab (Negev), since most of the those who do not receive the vaccinations belong to this community due to the inaccessibility of health care in their villages. It concludes that as a result, these children are denied medical services on charges of being Palestinian! Another instance is the Israeli government’s refusal to grant the Palestinian citizens living in certain villages and cities the right to take part in local council elections as a result of The Regional Councils Law passed in 2009. The Zionist entity even retains the right to revoke the citizenship of those Palestinian citizens whom it identifies as harmful to its national security. This right is guaranteed by virtue of the Amendment no. 10 (2011) to the Citizenship Law (1952). Those Palestinians whose citizenship is annulled cannot take part in the elections and will face serious difficulties in terms of their freedom of movement, especially in the East Jerusalem Al-Quds where they may want to take part in congregational prayers in the holy mosques. The Israeli regime has also prohibited any kind of advocacy activities by the Palestinians who call for the boycotting of Israeli goods produced and manufactured by the illegal settlers in the West Bank. This right is safeguarded by the Law for Prevention of Damage to the State of Israel through Boycott (2011) also known as the “Anti- Boycott Law.” The Anti-Boycott Law, passed on 11 July 2011, enables the filing of civil lawsuits against anyone who calls for boycott, and creates a new “civil wrong” or tort. The law also provides for the revocation of tax exemptions and other legal rights and benefits from Israeli associations if they call for or engage in boycott, as well as academic, cultural and scientific institutions that receive state support. The UN committee has also condemned the vociferous and loathsome rhetoric of the Israeli officials against the Palestinians, branding their public discourse a representation of xenophobia and racism. It has demanded that “all racist and xenophobic statements by public officials and religious leaders directed against Palestinians and against asylum-seekers of African origin should … be strongly condemned.” The extensive report goes on to list the other types of racial bigotry directed against the Palestinian people and even calls the continued blockade of the Gaza Strip a form of racial discrimination that should be lifted immediately. It goes without saying that the arbitrary detention of children and women, as well as the adults, and keeping them in jail for long periods of time without any charges or trial are among the other Israeli practices which the CERD has denounced. 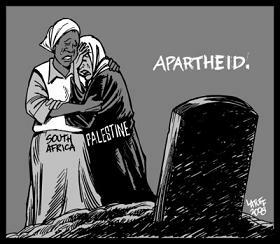 It’s quite evident that Israel’s policies and actions resemble the dark days of apartheid in South Africa, and can be categorized as the crime of apartheid. However, Prof. Richard Falk, the United Nations Special Rapporteur on the situation of human rights in the occupied Palestinian territories, has recently argued that for Israel to be held accountable over committing the crime of apartheid, it’s not necessary that its actions and policies be compared to those which were implemented in South Africa from 1948 up to 1999. “By the 1973 Convention and the Rome Treaty establishing the International Criminal Court, apartheid is authoritatively considered one form of ‘crime against humanity.’ It does not depend on establishing a ‘resemblance’ to the racist structure that existed in South Africa during its apartheid period,” he writes. “What is necessary for the crime to be committed is systematic discrimination against a specific group identified by reference to ethnicity, race, religion, and encoded into its governing structure,” and this systematic discrimination is what the people of Palestine have been long subjected to. Prof. John Dugard, who is another prominent international lawyer and a predecessor to Richard Falk as the UN rapporteur on Palestine has also drawn the same comparison between the apartheid system in South Africa and Israel. In his 2006 book “Palestine: Peace Not Apartheid,” the former U.S. President Jimmy Carter has presented the same analogy, likening the Israeli regime to the apartheid regime in South Africa. It’s not too difficult to conclude that Israel’s policies against the oppressed Palestinians are neither humane, nor justifiable, nor defendable. The fact that Israel has turned into an apartheid regime, is crystal clear, and even some former Israeli officials such as Ariel Sharon have implicitly confessed that they have established an apartheid regime in the lands they have stolen and invaded. Ariel Sharon had once told the former Italian Prime Minister Massimo D’Alema that ” “bantustan model” was the most appropriate solution to the conflict in the West Bank. The term “Bantustan” historically denotes the separate territorial areas designated as homelands for the blacks under the South African apartheid state. Apartheid is recognized as an international crime, and there’s The 1973 International Convention on the Suppression and Punishment of the Crime of Apartheid which clearly sets out the conditions under which the actions and policies of a government can be identified as resembling the crime of apartheid. Israel is now committing this crime overtly, ostensibly and unequivocally, any conscious man attests to it. Is there anyone who dares to hold Israel accountable and punish it?